Cookie. It is such a simple word. But it brings happiness to a lot of us. Think about it. Say “cookie” out loud. What are you thinking about? I’ll bet a great childhood memory, a delicious sugary sweet, or maybe that triggered a craving and now you want to eat one. Whatever the case may be, cookies are a treat that can inspire (they motivated me to one of my very first posts in this blog), comfort, or bring joy. And today, December 4th, cookies are given the honor of a national day of remembrance. So, in honor of the most popular of them all, here is one of my favorite recipes. It is the Nestlé Toll House recipe that helped to jump start my budding career as a baker when I was a child. And, it has continued to be the standard by which I judge all chocolate chip cookies. I encourage you to skip the pre-made cookie dough package in the grocery store and bake them from scratch. It might add a few minutes to your task, but the flavor and goodness of a freshly baked cookie is second to none. VeryBestBaking.com also has instructions for pan cookie, slice and bake, and high altitude variations of this recipe. 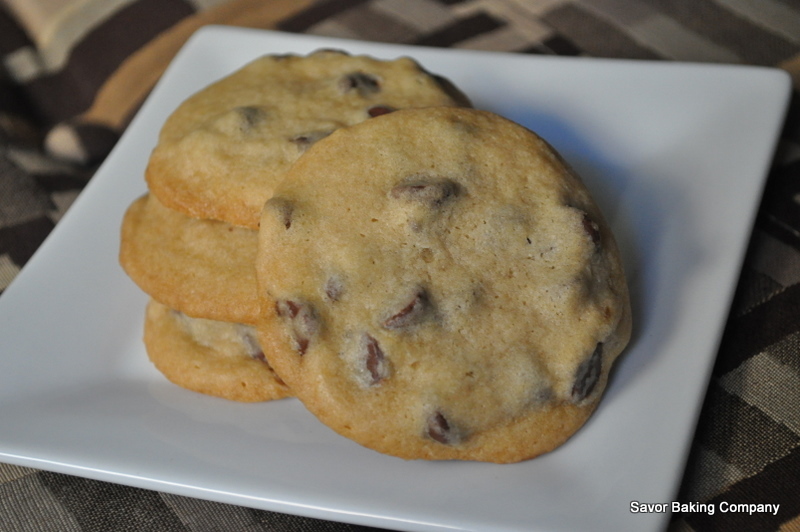 This entry was posted in Baking with Savor, Recipes and tagged baking, Chocolate Chip, cookies, National Cookie Day, Nestle Toll House. Bookmark the permalink.